While we could (and sometimes do) eat pizza every day, we’re just as excited as you are when the first full week of October rolls around. 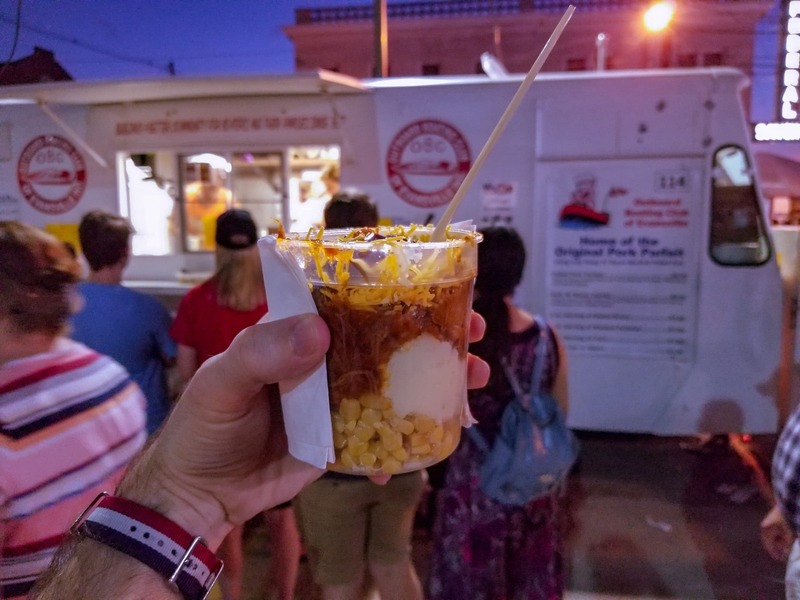 The West Side Nut Club Fall Festival is a whole week dedicated to fried food and the community, so you can count us in! We asked around the office to hear what everyone’s must-have items are each year. Hands down favorite is the cinnamon kuchen (this is the German word for cake by the way) from Resurrection. As an eighth grader, I would buy one in the school cafeteria that week and would just eat a whole one for lunch. I’m also a big fan of the steak sandwich from the USI Varsity Club. I appreciate how the same booths are in the same spots every year too so you always know where to find your favorite foods. Deep Fried Oatmeal Cream Pie – This was introduced to me by Kenzie, and I know she is going to put his on here too but I don’t care. It’s delicious and reminds me of when I was a kid. Resurrection Chicken and Dumplings – I have been eating this my whole life around this time of the year and it’s one of my favorite things about fall. As long as it’s started to cool down! USI Athletics Steak Sandwich – Simple ribeye sandwich is hard to beat. I used to think I was moneybags anytime I would splurge on a steak sandwich. If you can swing it, it’s worth the price. Oh ho ho where do I start. Not being from here has made getting to know the Fall Festival traditions oh so much fun. I have learned to go on lunch most days to avoid the crowds and lines… I usually go about 2 times outside of volunteering at a booth or two. My favorites are as follows: pronto pup, USI steak sandwich, I have found a new favorite in the BBQ pulled pork parfait! and finish it all off with a monster ear (I usually take half home)! I think this year I would like to try a Texas Tenderloin! Last year I thought I was only going to make it to one night of Fall Fest. It ended up not being the case, but that didn’t stop me from getting a lot of my favorites: Walking Strom (118), The Original Chicken & Dumplings (18), Monte Cristo (65), Pulled Pork Parfait (114), Donut Bank Burger (76), Deep Fried Mac & Cheese (75 or 119), and an Apple Cider (127). Monster Ear from the Boy Scouts. A crispy and chewy piece of fried dough with a cinnamon and sugar syrup coating it. So simple but well done and its been my favorite thing since I was a kid. Nothing else needs to be said. The only item I have to have every year. Haystack, loaded baked potato, and a bite of whatever Dan gets. Plus blackberry cobbler from SWIRCA. I don’t think I am a good person to get Fall Festival advice from as I am a pretty plain orderer. There are only a couple things I make sure I get when I go. Resurrection’s chicken and dumplings and a cold apple cider. I really enjoy both of these items but most of the enjoyment I get out of these come from nostalgia rather than taste. Going to Resurrection for grade school we got to smell the chicken and dumplings and kuchen all week, we also got to see all of the hard work that goes into making the dumplings from scratch. We also used to make field trips to apple orchards to get fresh cider. I’ll usually order the newest crazy dessert to finish off my meal. RIB GUMBO, BABAY! Booth? R-Men Varsity Club. Pop a spoon in this bowl (Styrofoam cup) and chow down on the most delectable soup the West Side Nutters have to offer. Why is it so tasty? Close your eyes, open your mouth, and let the R-Men warm your soul. This gumbo has a rich meaty broth, choice selection of vegetables, and delicious chunks of smoky rib meat. If you try this and you don’t like it- No. If you don’t love it, you are objectively wrong. Rib Gumbo is the right answer to EVERY question ANYONE can think of. 7/10 would recommend.